Louis XV hand carved and gilt boudoir mirror with parcel gray painting. Having a tied ribbon cartouche above a pair of love birds with tasseled cord and laurel leaves. Original mirror shows expected clouding and age. France, mid 18th century. Highly unusual white gold gilt Louis XV carved mirror with swags, of leaves, crossed arrows and quiver below a crown wreath of laurel leaves, French, circa 1780. 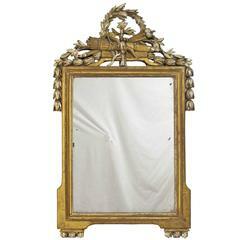 Fanciful Baroque style carved wood and gilt framed mirror with swirls and swags. Italy, late 18th early 19th century. Louis XVI style carved, gessoed and gilt mirror. Continental, mid-19th century. Unique gesso and carved gilt frame of flowers and acanthus leaves with a beveled glass mirror. English, 19th century. Label on the reverse. Mirror of later date. Finely carved French 19th century Louis XV gilt carved horizontal carved mirror. 19th century French carved overdoor with mirror Louis XV.